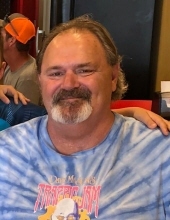 ST. JOHNSBURY, VT - Douglas M. McAllister, 58, passed away in the early morning hours of February 2, 2019. Doug was born February 16, 1960 to Albert and Theresa (Tremblay) McAllister and grew up in Naugatuck, CT before being stationed in Germany with the United States Army. In 1988, Doug and his family moved to Guildhall, VT and he spent his remaining years as a resident of Northern New Hampshire until his recent move to St. Johnsbury, VT.
Doug was an avid lover of sports who passionately supported his favorite teams, a proud tie-dye wearing “Dead Head”, and he couldn’t get enough of studying history and sharing it with all those who would listen. He is survived by his fiancée, Tina Hand of St. Johnsbury, VT, his mother, Theresa, of Naugatuck, CT, two brothers, Wayne (Dana) McAllister of Naugatuck, CT and David (Susan) McAllister of North Reading, MA and one sister Emily (Scott) Polek. Doug also leaves behind one daughter, Kari Hickey and her husband Ben of Groveton, two sons, Kyle McAllister and his significant other Samantha Binette of Berlin, Brandon McAllister and his wife Laura of Berlin as well as 11 grandchildren who he loved dearly – Kaden, Evan, Matthew, Brady, Aubrey, Cameron, Zachary, Ella, Kyra, Addison and Dylan – along with his cousins who he considered to be his “brothers”, Barry and Steve Drapeau and several nieces and nephews. He was predeceased by his father, Albert McAllister, Jr and grandson, Chandler McAllister. In respecting Doug’s wishes, there will be no calling hours or funeral services. "Email Address" would like to share the life celebration of Douglas M. McAllister. Click on the "link" to go to share a favorite memory or leave a condolence message for the family.